The kitchen sink and faucet you choose will be the focal point of your kitchen countertop project. When you are designing new countertops there are two important questions to ask. First, does the sink you want fit the cabinet you have? Second, will the faucet you chose fit your sink? Whether undermounted, top mounted or integrated (solid surface) the sink and attached plumbing will take up most of the space in a base cabinet. Therefore the sink must be the right size for the sink base cabinet. Sink flanges shouldn’t overlap the cabinet frame. 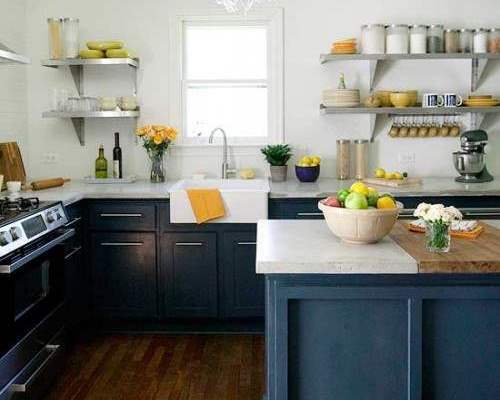 In most instances the sink is positioned tight to the front of the cabinet opening leaving as much room as possible for the faucet and other fixtures. With that in mind, if your cabinet has tilt-outs they may have to be sacrificed if you decide you want an undermounted sink. When a sink is located beneath a window you have to make sure the sink base cabinet is centered in the window opening. If it isn’t, you will have to decide whether your sink is going to be centered with the window or in the cabinet. If the sink is located directly beneath a bartop or in front of back splash you have to be certain there is enough space available for the faucet to operate correctly. When choosing a new faucet, don’t assume that any faucet will work with any sink. Not all sinks and faucets are compatible. Always get a copy of the manufacturer’s specification sheet, complete with diagrams and dimensions for both the sink and faucet and make they are compatible. It’s also important to make certain that the sink, faucets, sprayer, soap dispensers and other plumbing fixtures can be placed in the available space and not interfere with each other’s function. Find out the length or reach of your faucet’s spout (also called the projection). The distance between the faucet body (where the water enters the faucet) and the areator is usually 8 to 10 inches for a kitchen faucet. However some oversized faucets have a reach of 11 to 16 inch. Since faucet holes are generally cored 2¼ to 2½ inches from the inside edge of the sink the water stream from a faucet with a wide reach will likely fall in front of the drain rather than in the center which might result in water splashing out of shallow bowls like those of a prep sink. You need to make sure your fabricator is aware of any potential issues. The standard diameter of the hole cored for a faucet stem is 1 3/8”. It’s important to measure the length of the faucet stem to ensure there is enough threaded material to go through a 3 cm countertop to attach the faucet to the countertop. Some threaded shanks are too short for thicker material like 3 cm granite. Aftermarket extenders are available and if needed will have to be purchased to complete the installation. When you take the time to plan out of the location of you sink and faucets the fixtures will not only look great they will function properly as intended.